New student organization Students Today, Alumni Tomorrow (STAT) is making waves on the UM campus. First proposed to the Office of Student Life in December 2016, STAT has since hit the ground running in its effort to provide for University students through various acts of philanthropy. STAT’s primary mission is to raise funds and provide donations for the Student Emergency Fund and the Campus Food Pantry. Both the emergency fund and food pantry are campus resources meant to assist students in states of financial crisis, such as the inability to afford food, books or tuition, among other things. STAT also makes an active effort to spread awareness of the existence of those resources to both students and the Montevallo community. Current STAT President and UM senior Jason Perry said the emergency fund is meaningful to him because he has experienced the various struggles associated with being a college student. Although Perry didn’t receive help from the fund himself, he fosters an intense empathy for the hardships students go through and the strength they must display to balance their personal and academic lives. 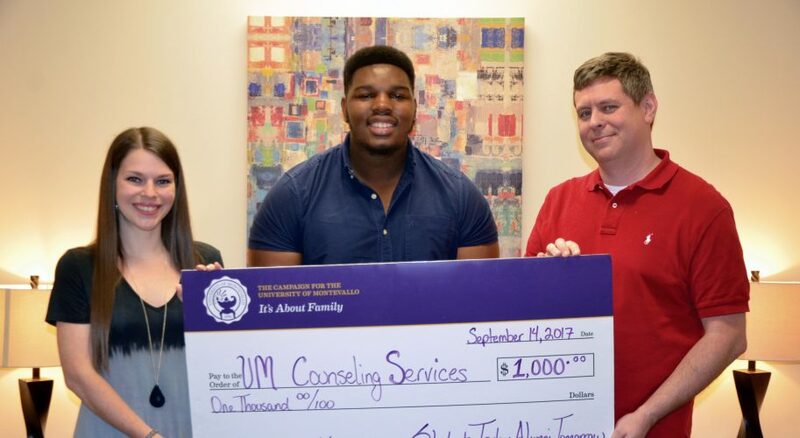 STAT Check Presentation: Rachel Haase (left) and Josh Miller ’07, of UM’s Counseling Services, (right) accept a $1,000 check for the Campus Food Pantry from Jason Perry (middle), president of Students Today, Alumni Tomorrow. The funds were raised as part of a drawing for a large prize basket full of UM items and gift cards. 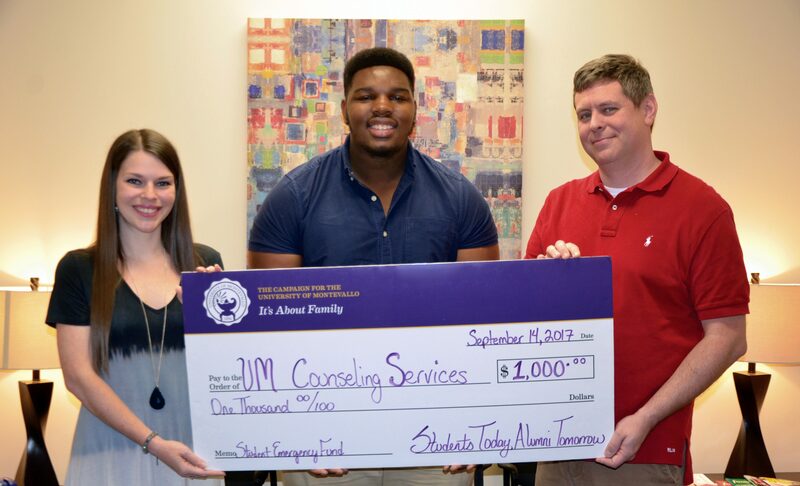 Since August, STAT has taken initiative in fulfilling its philanthropic goal. 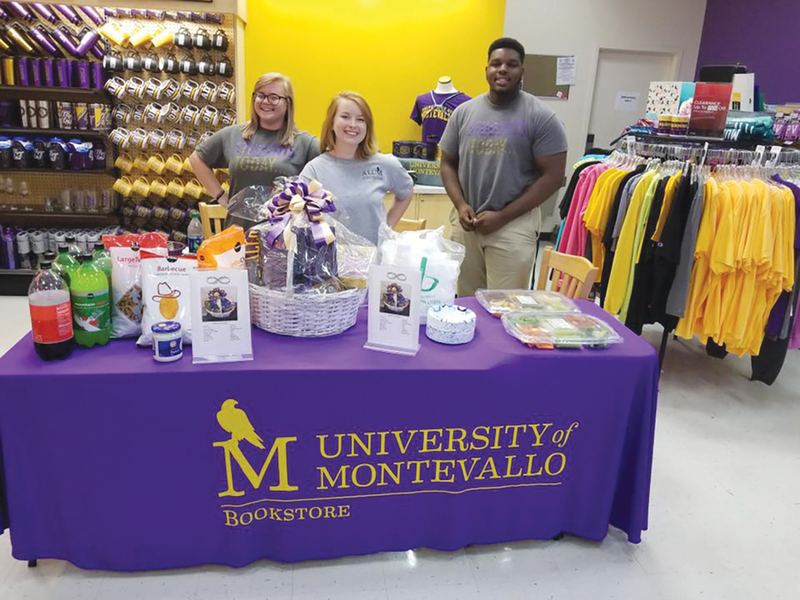 They have partnered with the University bookstore to host a drawing for UM supplies and apparel, participated in Carnival for a Cure and hosted a Student Day of Giving where four plastic tubs of food and toiletry gifts were donated to the Campus Food Pantry. STAT also works to promote engagement from young alumni. According to Perry, there is approximately a 10-year gap between students graduating and as alumni, making their first gift to the University. Working with the Office of Advancement and Alumni Affairs, STAT aims to close that gap by inviting new graduates to events on campus tailored to be comfortable for them to attend, allowing them to more easily stay involved with campus outreach. As for the future of STAT, Perry envisions the organization working even more closely with Counseling Services, providing not only donations but also services such as preventive methods seminars and other positive initiatives.